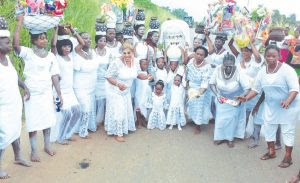 Ido-Ile, a serene community in Efon Local Government Area of Ekiti State, recently came alive with traditional festivals in honour of some deities in Yoruba cosmology. It used to be identified as Ido Ajinare, meaning Ido that is far away. It is the source or origin of Ido-Ekiti or Ido Faboro, a more cosmopolitan town in Ido Osi Local Government. According to residents, Prophet Julius Kumoluyi, of The Word Bible Church, held a crusade in the town and advised that the name, Ido Ajinare, be changed to Ido-Ile. Obatala, Sango, Osun, Esu and Oya among other deities were celebrated through a reenactment of the life and times of these deities. For over a week, the community witnessed series of traditional festivals featuring dances, songs, incantations, sacrifices and merriments. Obatala, a Yoruba deity believed to have the authority from the Supreme Being, the Almighty, to mould humans into any form he deems fit and assigns destinies for human beings, was the first to be celebrated. Residents young, old and even kids, trooped out very early in the morning, they wore white dresses, and chalked their bodies in white, signifying purity, which they claimed the deity Obatala represents. The young ladies carried baskets containing toys, provisions, edible materials and towels. The basket is named Korikoto and its carriers are called Elere Omo, meaning children who belong to some spiritual groups and have their destinies influenced by such groups. 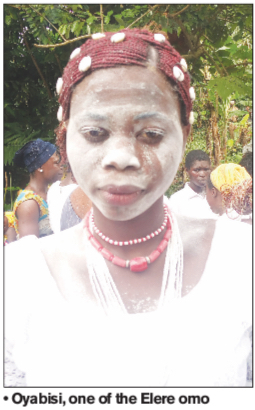 There were also female kids who carried white calabashes wrapped with white wrappers. The calabashes contained fruits and all kinds of edible things. These kids claimed they were little priestesses of the Obatala deity. They are chaste and that qualified them to carry the white calabashes. The carriers of Korikoto and white calabashes of Obatala danced and sang towards a river, named “Omi Efun,” meaning “white water.” The river is believed to be the contact point between human worshippers and Obatala deity. So, the worshippers, over 500 of them, danced and sang at the bank of the river. Many of their praise songs eulogized the deities they claimed serve as intermediaries between them and the Supreme Being or the Almighty God, called “Eledumare” in Yoruba. In what appeared like a crusade to stir up their spirit and invoke the deity they worshipped, they sang and clapped, urging the deity to display its power and reign blessings on them. Leader of the worshippers, Princess Ike Obaleye, founder, Princess Ike Obaleye Trado Medical Firm, Ibadan, Oyo State, explained: “I am Obabinrin Sango, (head of women devoted to Sango deity), l am from Ido-Ile here. I am a priestess of Sango and all my grand parents are Sango priests. “I have been doing this since I was about one and a half year old. When I grew up I nearly left the worship of Sango. When I wasn’t doing this, I was having problems. I suffered for several years. But since I returned to this tradition and worshipping the deities, things had turned round for good for me. “It has been 28 years now and I have been doing very well. We are the true believers. We have unity. You can see that we used only one calabash to drink water. I do not think the people of other religions can be this united. Another devotee, Sangokeyede Akinade, the Baba Osa, (custodian of deities), said: “l used to be a Christian, attending church vigils and praying fervently because I had problems. But later I was called into worshipping the deities. “I had serious problem with my business before I began this practice. But those problems have disappeared now that I have been worshipping the deities. This shows that this is my way. “I advise our people not to see us as ignorant people who don’t know anything. We know what we are doing. That you are into some foreign religion doesn’t stop you from observing your traditions because everything comes back to God. Ifagbemiga Balogun, is another young priest. He holds the traditional title of Balogun Olorisa (head of the warriors of the deity): “I am in charge of the shrine of the Obaleye group. Whenever we want to observe the Obatala festival. We choose a market day, which usually falls on a Wednesday of the seventh month. “I am a priestess of Obatala. We are here celebrating Obatala festival. I am the head of all the women who serve Obatala. We are all worshipping God here. I was born in Ido-Ile and l am from Ogua lineage. My mother’s place is Elu, a royal family in this town. “I was born into a Christian home but from our origin, traditional religion has been there. I was a big member of a popular church in Ibadan. It was even my pastor who called me one day and told me to go and join my mother in her traditional ways. “Truth is that many of those who profess to be Cherubim and Seraphim and Celestial Church members are actually worshippers of Osun, Sango, Oya and other deities. They merely use the church thing as cover. We are not here to expose anybody, as we know we are all worshipping God. “Obatala is also called Baba Arugbo, (old man). He is a favourite of the Almighty who moulds human body. The only power he doesn’t have is to give life to human beings but he has powers to decide what shape, or destiny a man would have. “Some of the girls who carried Korikoto and white calabashes with all sorts stuffed in them, are Elere Omo. Those with white calabashes are for Obatala. Some of the benefits of doing this include making them to be chaste, humble and have progress in life. “The calabash of Elere Omo, is being carried as ritual of worship to appease the powers behind the girls’ various spiritual groups. No one on earth who doesn’t belong to one spiritual group or the other. So, in this light, everyone has got to find a way to appease his spiritual group so he can progress on this earth. One of the ways to please your spiritual groups is to get many fruits and edible things for the ritual of appeasement. “We are in this river called Efun, anything we bring here to worship the deity, including the dove I am having here, has to be alive not dead. I advise anyone who is having challenges that he doesn’t understand what brought it to go seek for a way out through spiritual means. “I urge our pastors and imams not to deceive their members by keeping them in the dark in their religious organisations so they could profit from them. They should tell them what destiny holds for them and if the way out for them is to follow their traditional practices. “I urge these people not to deceive their members. They should ensure they say the truth about the destiny of these people, about what way they should choose to make it in life. Oyabisi Alade, 22, is one of the carriers of the Korikoto. She is an Elere Omo: “I am from Elu quarters in Ido-Ile. We are celebrating Obatala Obatasa Oba maria. We are celebrating Obatala because he is a good god and a moulder of heads. “Last year, he moulded me well and this year l have come so that he could give me great fortune. We wear white because this god only loves purity. He abhors evil. We wear this white clothing and chalked our bodies with white for protection. All of us who are Elere Omo are seven and we carry seven deities. Three of them are more important for us and they are those that belong to three of our leaders here. “Korikoto, the basket containing all sorts that we carry, stands for those who are having challenges caused by their spiritual groups. Such challenges include barrenness or inability to have happiness in marriage or any kind of misfortune whatsoever. “We carry the Korikoto every year to appease our spiritual groups. We stuff the Korikoto with all kinds of things as you can see. The Korikotos are kept inside the groove of the deities till the next festival season.